Born: 6 May 1872, Sneek, Netherlands. Died: 20 November 1934, Leiden, Netherlands. 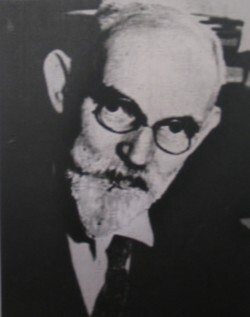 Willem de Sitter, Dutch theoretical astronomer, mathematician and cosmologist, was a student at Groningen, the Netherlands, in 1896 when David Gill* met him in the Astronomical Laboratory of Groningen, where he assisted Professor J.C. Kapteyn*, and persuaded him to visit the Royal Observatory, Cape of Good Hope, to assist in practical astronomical work. After being awarded the Bachelor degree in 1897 he arrived at the Cape on 27 August 1897 and stayed until 6 December 1899. During this time he befriended R.T.A. Innes* and assisted Gill in the measurement of the parallaxes of 16 stars with the Repsold heliometer. Gill published the results in the Annals of the Cape Observatory in 1900. De Sitter also made a series of observations with the Zollner photometer to determine the relation between the visual and photographic magnitudes of stars in different galactic latitudes. The results were published in Groningen Publications No. 12. He also helped with the reduction of heliometer observations of Jupiter's satelites carried out mainly by Gill and W.H. Finlay*. This work formed the basis of his doctoral dissertation, Discussion of heliometer observations of Jupiter's satelites (Groningen, 1901). It was followed by A determination of the inclinations and nodes of the orbits of Jupiter's satelites (Edinburgh, 1906), based on plates taken at the Cape under Gill's direction. After further work he produced Derivation of the final inclinations and nodes of the orbital planes of Jupiter's satelites from the Cape observations of 1891, 1901, 1902, 1903 and 1904 (Edinburgh, 1914), followed the next year by Determination of the mass of Jupiter and elements of the orbits of its satelites from observations made with the Cape heliometer (Edinburgh 1915) and two further papers on a new mathematical theory of Jupiter's satelites (1918, 1925). Finally in 1929 he published his definitive results, but was still working on tables of the motions of the satelites at the time of his death. While in South Africa De Sitter married Eleonora Suermondt in December 1898. After his return to Groningen he was appointed as an assistant in the Astronomical Laboratory. He visited South Africa again in 1905 to attent the joint meeting of the British and South African Associations for the Advancement of Science. In 1908 he was appointed professor of astronomy at the University of Leiden and in addition became director of Leiden Observatory in 1919. During 1916-1917 he published a series of papers on the astronomical consequences of the general theory of relativity and in 1932 he and Albert Einstein published a joint paper in which they proposed the Einstein-de Sitter model of the universe. He also made important contributions to the revision of the fundamental constants of astronomy. In total he produced about 200 publications and received many honours for his outstanding contributions. He served as president of the International Astronomical Union from 1925 to 1928. In 1923, in his position as director of Leiden Observatory, de Sitter concluded an agreement with the Union Observatory in Johannesburg, then directed by Innes, to encourage cooperation between the two institutions. In 1929 he again visited South Africa, to attend the second South African meeting of the British Association for the Advancement of Science. During this visit he was elected an honorary member of the Astronomical Society of Southern Africa and was awarded an honorary Docter of Science (DSc) degree by the University of Cape Town. Churms, J. Stellar parallax work at the Cape. MNASSA, 1970, Vol. 29(8), pp. 102-109. Google scholar. http://scholar.google.co.za Publications by W. de Sitter. Smits, P. Presidential address: The Astronomical Society of Southern Africa. MNASSA, 1960, Vol. 19(7), pp. 79-93. Vermeulen, D. Living amongst the stars at the Johannesburg Observatory. Johannesburg: C. van Rensburg, 2006. Willem de Sitter. In: MacTutor History of Mathematics, http://www-groups.dcs.st-and.ac.uk/history/Biographies/Sitter.html as on 2016-7-3.